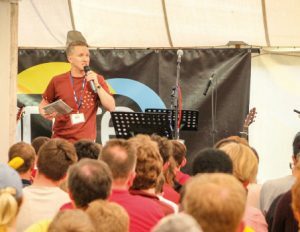 From Friday 25th to Monday 28th May around 250 young people and leaders from across England and Wales came together for Unite at Felden Lodge. Unite is a weekend camp featuring a semi-structured programme throughout the weekend, primarily aimed at 11 to 18 year olds. It is a great opportunity to enjoy a range of different activities, explore the Christian faith and meet other people from around the region. Throughout the weekend there were activities including football, archery, hockey, rounders, American football, strong person competitions, a quiz, a campfire and much more. 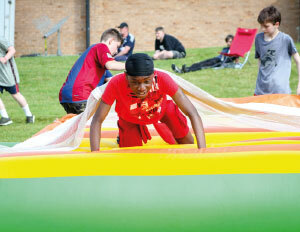 There was even Unite’s version of Total Wipeout, where teams took part in a range of challenges including an inflatable assault course, wrecking ball, water games and puzzles! Evening entertainment included a film, Minute to Win It challenges, a disco (which included a VIP area with mocktails and a photo booth), and Unite’s Got Talent, the popular talent show which again featured a number of memorable performances! There were times of worship where everyone came together in the Marquee (the main venue). The speaker was Jim Sutton, who is one of the pastors of Balham Baptist Church in south west London. He spoke on the theme “Faith, Hope and Love”, based on 1 Corinthians 13:13. Each group at Unite was part of one of three ‘villages’: red, blue and yellow, each led by two Village Leaders. The villages competed against each other throughout Unite to earn points for taking part in activities and winning competitions, with the aim of being named the ‘best village’ during the Unite awards ceremony at the end of the weekend. 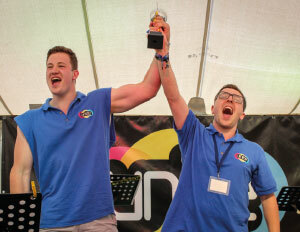 The winners this year were the blue village, led by Sam Lindridge and Dan Charles of 3rd Gateshead. Well done blues! We’re already looking forward to Unite 2019, which will take place from Friday 24th to Monday 27th May. For more details as they become available keep an eye on the website and social media!